A highly atmospheric region, Marche is a romantic and picturesque location for your Italian wedding. With its spectacular coastline, scenic interior and many historic towns and villages, Marche is typically Italian and offers everything the country is famous for. The ceramics industry is very important, and you may well choose to buy some hand crafted pottery as a souvenir of your time here. Marche’s coastline is beautiful, particularly the Conero Riviera, which features many pretty coves separated by dramatic white cliffs, as well as larger resorts. The Rosso Conero wine is produced in this region. The most extravagant resort in the region is San Benedetto del Tronto, which boasts a white sand beach six kilometers long and no less than 5000 palm trees. 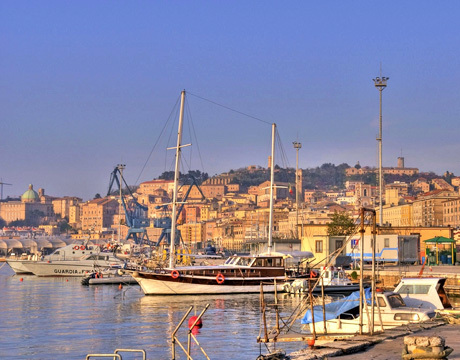 A place that brings together the natural beauty of Marche’s coast with its historic significance is the seaside resort of Pésaro. Pésaro is a quiet town which makes a good base from which to explore the region, with a long stretch of beach and a well preserved Renaissance center. The natural highlights of inland Marche include the stunning Sibillini mountains, which tower over the hill villages of the south west. Other standout features are the Esino Valley, the Fracassi caves and vineyards which produce a dry white wine. Marche has much to recommend it to lovers of culture and history. The centerpiece of the small hilltop town of Urbino is a spectacular Renaissance palace, whilst the fortress at San Leo is also well worth visiting. Ascoli Piceno is a fascinating city, whilst Macerata is a lively historic town with a varied cultural life that includes an annual ballet and opera. The town is surrounded by beautiful Italian countryside. From beaches to mountains and towns to countryside, Marche is a both dramatic and picturesque. The region will provide a lovely backdrop to your wedding in Italy.